Exercise through gaming or 'exergaming' could be a viable alternative to help people with Multiple Sclerosis live happier and more active lives, researchers at Teesside University have found. The new study revealed that using the Nintendo Wii Fit game was equal to traditional physiotherapy balance exercises for improving the balance of people with Multiple Sclerosis (MS). But, significantly, those with MS reported that they found the Wii Fit more engaging and were more likely to use it regularly, over a prolonged period of time. Impaired balance is reported as one of the most disabling aspects of MS and people with the condition are encouraged to do regular exercise while they are physically able to. A team of researchers from Teesside University’s School of Health & Social Care carried out a study with over 50 people clinically diagnosed with MS to examine the effects of exergaming on their balance. They were split into three groups, with one group receiving balance training using the Nintendo Wii Fit, the second receiving traditional physiotherapy balance training and the third group receiving no intervention. In terms of the physical effects of exergaming, those using the Wii Fit saw an equal improvement in their balance to those using traditional physiotherapy exercise and a significantly greater improvement to those who received no intervention. 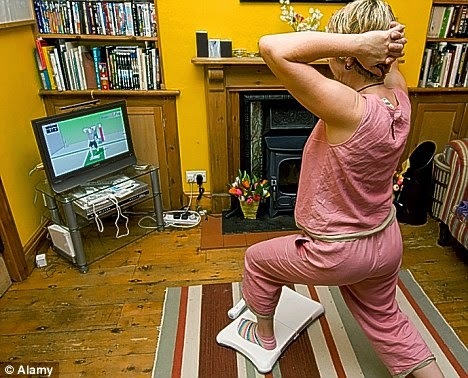 Although the study found exergaming to be on par with traditional methods for improving balance, users found the Wii Fit more engaging and would be more likely to continue with regular exercise using this method. Jonathan Robinson, a Senior Lecturer in Research Methods at Teesside University, led the study. He said: 'People with MS are encouraged to be as active as possible for as long as they can. But, one of the biggest problems for physiotherapists in general is getting people to continue with their exercise and, as MS is often self-managed, a lot of people report getting bored and giving up. 'Our research has found that using the Wii Fit to exercise is as beneficial as traditional methods in terms of improving balance, but users find it a lot more enjoyable and engaging. For them, it doesn’t feel like exercise, it feels like playing a game which has the same benefits as exercise. 'This is significant as people with MS are more likely to continue their exercise over a prolonged period. Exergaming is a promising new alternative to traditional modes of therapeutic exercise which may be preferable and more effective for people with Multiple Sclerosis. Keith Craven has had MS for 12 years and is Chair of the Teesside branch of the Multiple Sclerosis Society. He took part in the study, along with other branch members, and said that exercising using the Wii Fit offered something different. 'It got very competitive and everybody enjoyed it,' explained Keith. The Wii Fit balance exercises involve people doing basic side to side and forward and backward movements. Jonathan added: 'There have been various studies comparing exergaming to traditional physiotherapy exercise, but this is the first three-armed trial which also compares the methods against people who receive no intervention. At present the researcher, Jenny Baron, is actively looking for people with MS for the study and, so far, over 20 people have already completed or are taking part.